The greatest seafaring adventurer of all time returns to the high seas: Sinbad, the sailor! Born of countless legends and myths, this fearless rogue sets sail across the seven seas aboard his ship, the Blue Nymph, accompanied by an international crew of colorful, larger-than-life characters. Chief among these are the irascible Omar, a veteran seamen and trusted first mate; the blond Viking giant, Ralf Gunarson; the sophisticated archer from Gaul, Henri Delacrois; and the mysterious, lovely, and deadly female samurai, Tishimi Osara. All of them banded together to follow their famous captain on perilous new voyages across the world's oceans. Writers Nancy Hansen, I. A. Watson, and Derrick Ferguson offer up three classic Sinbad tales to rival those of legend while adding a familiar sensibility from the cult favorite Sinbad movies of FX master Ray Harryhausen. Sinbad - The New Voyages, Volume 1 will enthrall and entertain all lovers of fantasy adventure in a brand-new way. So pack up your you traveling bags, bid adieu to your loved ones, and get ready to sail with the tide as Sinbad el Ari takes the tiller, and the Blue Nymph sets sails once more - its destination worlds of wonder, mystery, and high adventure. Featuring cover art by Bryan Fowler. If you could sum up Sinbad - The New Voyages, Volume 1 in three words, what would they be? I really enjoyed the stories overall. 3 separate tales all part of the new Sinbad mythology. Pulp fiction is not what I have been reading so much these days, but this was a wonderful nostalgic trip to my youth. It was the perfect blend of fantasy and adventure to wet my appetite complete with fantastic beasts, loyal companions and swashbuckling adventures. Sinbad is truly presented as a larger than life trickster hero just as he was intended. I really enjoyed “Sinbad and the Sapphire of the Djinn” the best of the three tales. Starting off with his crew angry at his foolishly made bet and ending in a way only Sinbad could deliver, it was great.The twist with the princess was my favorite part though I refuse to spoil it! Return to a time of fabulous adventures. 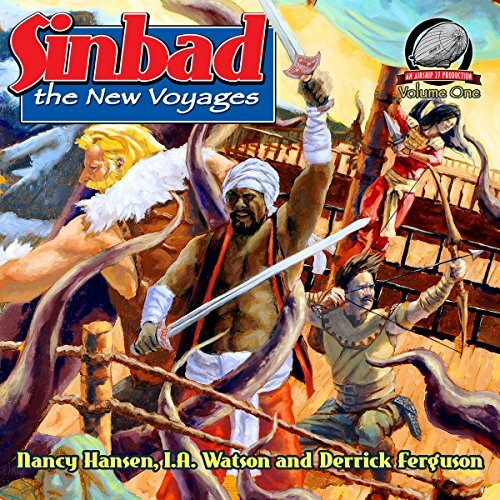 Where does Sinbad - The New Voyages, Volume 1 rank among all the audiobooks you’ve listened to so far? Easily one of the top five. Each story was fast paced with plenty of action. Which character – as performed by Jem Matzan – was your favorite? Henri, the French archer. I love Matzan's French accent when voicing him. No, with three stories, it was fun to break them up. Jem Matzan is a great voice actor and I love his enthusiasm in portraying the characters. The stories in this book are a delight and a fine continuity to the old Ray Harryhausen movies of Sinbad the sailor. The characters and stories are faithful to what I had expected as a fan. Of course it couldn't have been a real Sinbad book without cool monsters galore and the author(s) have given us a generous helping of classic creatures. I absolutely loved listening to this and am hopeful to see a volume two soon. You have captured the imagination of that little kid in me who spent so many hours hypnotized by the old Sinbad movies. Well done. Sinbad teams up with a crew of multicultural stereotypes, a quiet enigmatic female samurai, a blonde and bearded heavily muscled axe wielding Viking, and a sophisticated womanizing French archer. The writing and performance reminds me more of a Saturday morning cartoon than a swashbuckling adventure in line with the Three Musketeers or Captain Blood. I was hoping for a lighthearted sword and sails adventure but this borders on laughable. The crew are probably the worst part. The cliches abound! Jem's performance shifts from bad Arnold Shwarzenegger impression for the Viking to bad Gerard Depardieu impression for the Frenchman. The good? I enjoyed Jem Maztan's portrayal of Sinbad! It was a little over the top, but fun. Otherwise, It's a really tough listen.